UKAS in partnership with The Royal College of Physicians (RCP) will be attending the 25th Annual Meeting & Exhibition of the British Society of Echocardiography. The Conference will be held at the Queen Elizabeth 11 Conference Centre in central London on Friday 11th and Saturday 12th November. The Conference attracts Echocardiographers who will have the opportunity to network and attend seminars hosted by specialists in the field. This year features a keynote speaker, an international presenter, Professor Luc Piérard, Full Professor of Medicine from the University of Liege in Belgium. 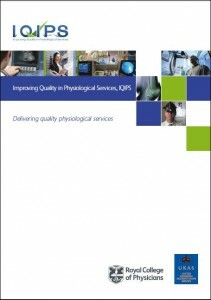 UKAS and the RCP will be available to discuss the Improving Quality in Physiological Services (IQIPS) scheme. This is a professionally led programme with the aim of improving services, care and safety for patients undergoing physiological tests, examinations and procedures. The RCP hosts the IQIPS programme, and develops and maintains the standard supported by an expert group of healthcare scientists, patients, doctors and other professionals involved in physiological services. UKAS delivers and manages formal third party assessments and accreditation against the IQIPS standards for the IQIPS accreditation programme. IQIPS is recognised by the CQC. You can find out more about the IQIPS programme here.